Over the last week or so, Coach John Cook issued a challenge to the Nebraska faithful: pack the Devaney Center for the Red-White Scrimmage and give the newcomers on the team a look at what the atmosphere is like on match day. Nearly 8,000 people answered that call on Saturday as the Red team, made up of returning starters and others pushing for starting spots, won the match 2-1 (25-19, 25-17, 20-25). “It’s really hard to describe, to have a Red-White game and have that many people and the energy was really good, even though it’s hard to cheer for people or to know how to cheer,” Cook said. “I’m sure there were a lot of first-time fans that got to see that and I thought there were spurts of really good volleyball." Cook called the match after three sets despite the White team winning the third. Red roster: freshman Nicklin Hames at setter, freshman Callie Scwarzenbach and sophomore Lauren Stivrins at middle blocker, sophomore Jazz Sweet at opposite hitter, senior Mikaela Foecke at outside hitter, freshman Megan Miller at defensive specialist and senior Kenzie Maloney at libero with sophomore outside hitter Sami Slaughter off the bench. White roster: junior Mari Kurkova at setter, sophomore Anezka Szabo and alumna Amber Rolfzen at middle blocker, manager Jake Roberts and alumna Kadie Rolfzen at hitter, freshman Chen Abramovich at defensive specialist, sophomore Hayley Densberger at libero and freshman hitter Capri Davis and senior setter Brooke Smith off the bench. The White team struggled to find a rhythm offensively in the first set as the Red team jumped out to a 3-0 lead and cruised from there, holding the White to -.065 for the set. The Red, led by Hames, hit .250 in the set with six different players recording at least one kill. White settled down and put up more of a fight early in the second set, but Hames served the Red to a 6-0 run midway through the set to make it 17-9. The Red team closed out the set to take a 2-0 lead heading into the intermission. The Red out-hit the White .276 to .098. The White team turned the tables in the third set, however. They ripped off a 5-0 run to take control at 12-9 and the Red drew no closer than within two points the rest of the way. A 6-0 run served by Densberger gave the White team an eight-point cushion and Kadie Rolfzen delivered the final kill on a set-up by Densebrger to close out the match. Sophomore outside hitter-turned-middle blocker Anezka Szabo, affectionately known as the Block Nesh Monster by her teammates, recorded five blocks in the third set alone as the White team held the Red to .079 hitting. 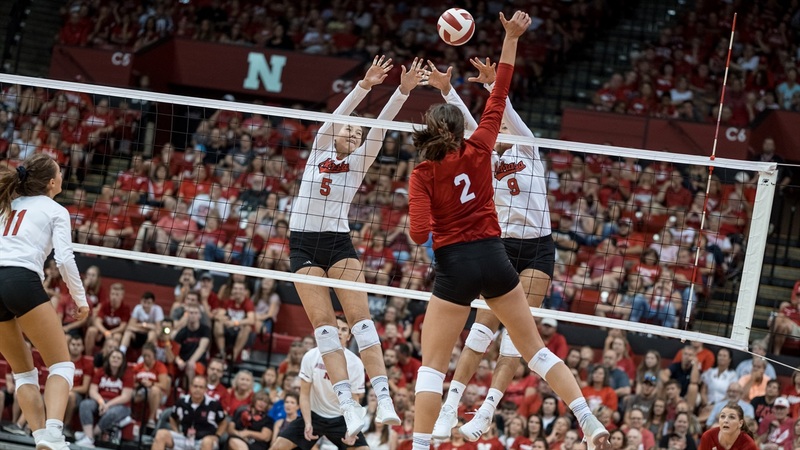 Hames arrived in Lincoln with considerable hype as she was PrepVolleyball.com’s top-rated setter recruit in the 2018 class and she did nothing to derail that hype train on Saturday. On her first serve — the first of the game — she hit an ace. She finished with three aces, 26 assists and 11 digs — all match-highs, and also converted all three of her attacks into kills. On the other side of the net, freshman outside hitter Capri Davis made an early impression for the White team, recording a match-high eight kills in the first two sets. With the rest of the White team’s attackers struggling to find a rhythm, Davis showed off a powerful arm and a quick swing. She struggled in the third set but still finished with nine kills to lead all active players. Overall, there were 40 errors between the team in two sets, something that didn’t exactly shock Cook based on what he’s seen in practice to this point. However, with only eight days of preparation under their belts a bit of sloppiness was to be expected. Cook praised the floor defense and passing and said he was encouraged by the teams' performance. 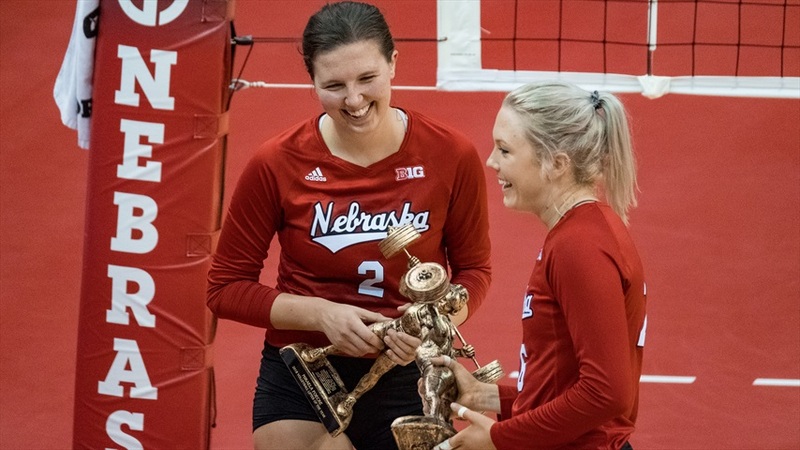 Following the match, Nebraska awarded the coveted “Lifter of the Year” award to two players: Foecke and Stivrins. Normally reserved for one player, the team vote resulted in a tie. Outside hitter Mikaela Foecke and middle blocker Lauren Stivrins receive their Lifter of the Year awards. Cook said Foecke improved her performance index testing by more than 400 points (after already posting a good score as a junior) while Stivrins joined the 2,000 point club with her testing scores. NET also debuted its documentary on the 2017 volleyball team, “Nebraska Volleyball: Culture of a Champion,” on the video board after the match. Many of the 7,965 fans from the match stuck around to watch the documentary while the team took it in from the benches. The team wrapped up the day with an autograph session for the fans. Nebraska has just under a week left of preparation before the Huskers will host No. 7 Florida in the VERT Challenge to open the 2018 season.